TuneUp Utilities is multi professional software suite used to maximize computer speed, increase system health, fix registry, start up and shutdown problems. Move an old and slower PC towards next generation computer’s speed with optimizing major parts. A faster computer will always best in working while you are at home or office, it will respond immediately but the slower one will makes it operator lazy. Each of error, bug and issue will be solved after running 1 click maintenance program regularly. Furthermore, the powerful engine will take less resources, optimize hard drive, RAM, registry and other main operators. 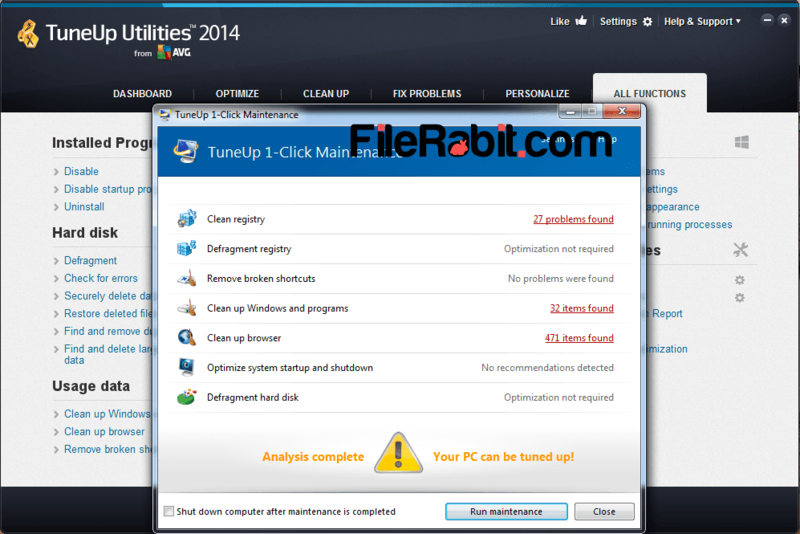 TuneUp Utilities is multi tool powerful software suite used to maintain the flow of speed for new computers and speed up performance of older computers. Installing new windows in older computers will take more money because they are lazy and will take more time than never systems. Get extra space with deleting temporary files, cleaning cookies, log files and wiping out recycle bin as well. Clean junk files of about 200 programs to get amazing results in speed, performance, battery and free space. It will optimize all sections of PC to produce more battery timing, more hard drive space and more speed in performance. 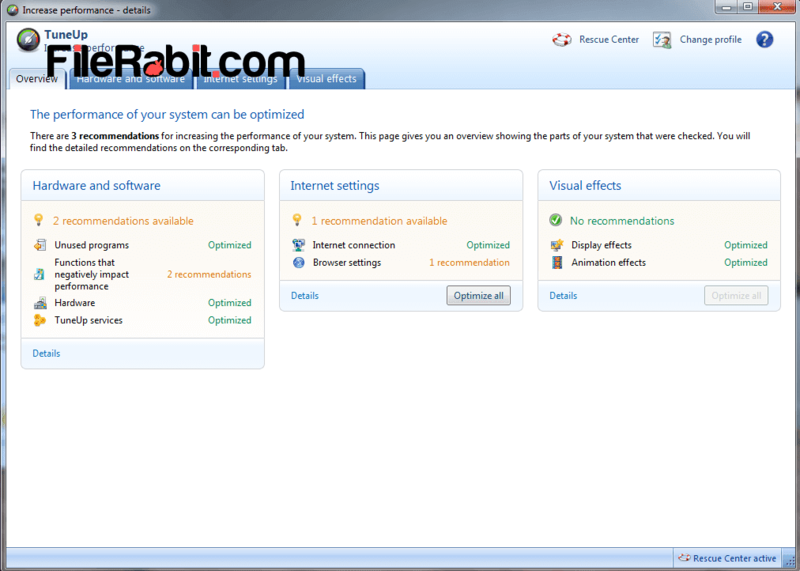 The program is designed especially for slower computers that will consume battery quickly with eating RAM and CPU resources. We can say its all in one software suite that includes collection of tools and utilities to do a quick service of computer software. 1 Click Maintenance: A powerful program used to find and clean registry bad values, junk files, temporary files, logs, broken program shortcuts, web browser issues and also cleaning of Windows internal and external programs. Visualization Improvements: will perform different actions such as optimizing display and animation effects to improve performance of computer. After cleaning, a movie or video will be played more faster and smooth manner then before. Long Battery Timing: Killing unknown background running apps to optimize system space, free up hard drive and maximize overall performance. This will put a deep impact on battery performance and you will see battery timing will be increased automatically. Free Hard Drive Space: Deleting temp and junk files from windows as well as from third party software. It will give more free space to user’s that is mostly in GB’s. Furthermore, disk defragment will optimize hard disk data in sequence and increase its life. Registry Repair: Windows Registry editor is the main functional resource which will control every operation inside computer. Many times the registry will rich with bad, corrupted, deleted and unknown entries. These collection of worst data will make your computer slow in running so Registry needs a doctor. TuneUp will scan all its entries, repair bad entries and extra entries will be removed.